Use of the bacterium Pseudomonas aeruginosa to influence the growth and activity of some pathogenic fungi to plant maize, Zea mays. L.
أستخدام بكتريا Pseudomonas aeruginosa للتأثير في نمو ونشاط بعض الفطريات الممرضة لنبات الذرة الصفراء Zea mays .L. 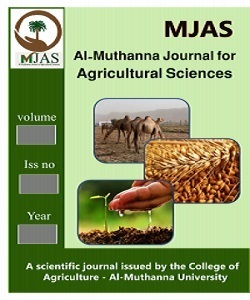 Was to isolate and diagnose 5 local bacterial isolates Pseudomonas aeruginosa from 20 soil samples in the Agricultural College of Agriculture, University of Baghdad . Tested their ability to control vital Aftran Fusarium solani and Aspergillus niger nurse Bdhurenbat maize . Outperformed bacterial isolation (AB4) in its ability to inhibit the growth of fungi and F.solani A.niger being of their growth rate was 2.3 mm and 2.4 mm on the two mediums Alzeraaan King-B, PDA , respectively, compared Baezzlat and other treatment comparison as it was the growth of fungi 12 0.20 and 20.35 mm respectively . He studied the effect of bacterial isolates in seed germination presence and absence of pathogens has been shown that vaccination seeds isolated bacterial Pseudomonas aeruginosa led to increase the percentage of germination and protection from the impact of pathogenic fungi , as the percentage of germination of 80% for the fourth day and 60% for the day Xrmen period cuddling compared to other treatments . Extracted compound Alkhalb Iron Alseidrawfor (Siderophore) produced by bacterial isolates then diagnosed amino acids involved in the installation , a leucine and alanine and threonine using infrared technology (FT-IR). جرى عزل وتشخيص 5 عزلات محلية لبكتيرية Pseudomonas aeruginosa من 20 عينة تربة زراعية في كلية الزراعة جامعة بغداد . اختبرت قدرتها في المكافحة الحيوية للفطرين Fusarium solani وAspergillus niger الممرضة لبذورنبات الذرة الصفراء. تفوقت العزلة البكتيرية (AB4) في قدرتها على تثبيط نمو الفطرين F.solani وِA.niger أذ كان معدل نموهما 2 ، 3 ملمتر و2 ، 4 ملمتر على الوسطين الزرعيين King-B ، PDA على التوالي مقارنة بالعزلات الاخرى ومعاملة المقارنة أذ كان نمو الفطرين 12، 20 و20 ،35 ملمتر على التوالي . درس تأثير العزلات البكتيرية في انبات البذور بوجود وعدم وجود الفطرين وقد تبين ان تلقيح البذور بالعزلة البكتيرية Pseudomonas aeruginosa ادى الى زيادة نسبة انباتها ووقايتها من تأثير الفطريات الممرضة ،أذ كانت نسبة الانبات 80% لليوم الرابع و60 % لليوم العاشرمن فترة الحضن مقارنة بالمعاملات الاخرى. استخلص المركب الخالب للحديد السايدروفور ( Siderophore) الذي انتجته العزلات البكتيرية ثم شخصت الاحماض الامينية الداخلة في تركيبه وهي الليوسين والالانين والثريونين باستعمال تقنية الاشعة تحت الحمراء (FT-IR).